Is your child intelligent when it comes to all kinds of things, but cannot cope well with school? He or she may be suffering from a particular vision issue, which creates an obstacle in the way of learning. It's called Convergence Insufficiency (CI). CI is a problem that impacts one's capability to see, read, learn and work at close distances. Someone suffering from CI has a hard time, or is entirely not able to coordinate his or her eyes at close distances, which makes everyday activities, like reading, extremely difficult. And because they want to avoid double vision, they try harder to make their eyes turn back in, or to use the correct medical term, converge. That might not sound all that bad, but that additional effort often leads to an astounding amount of difficult symptoms including headaches from eye strain, blurry or double vision, tiredness and difficulty concentrating, and the inability to comprehend even during short periods of reading. At the extreme end of the CI spectrum, the eyes will turn outwards, which is known as strabismus. Other things that may indicate CI include if your child frequently loses his or her place while reading, squints, rubs, closes or covers an eye, has a hard time remembering what was read, or says that words appear to move, jump, swim or float. Another issue that often comes up is motion sickness. CI is usually misdiagnosed as learning or behavioral issues like ADD, ADHD, dyslexia or anxiety. And furthermore, this vision condition slips under the radar during school eye screenings or regular eye exams using only an eye chart. Anyone can have 20/20 vision, but still have CI and therefore, struggle with reading. The good news is that CI often responds well to professional treatment. 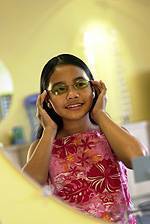 Treatments generally involve vision therapy performed by an eye care professional with practice at home, or the use of prism glasses, which will minimize a number of symptoms. Unfortunately, people aren't screened thoroughly enough, and because of this, aren't getting the treatment they require early enough. So if you've noticed that your child is having a hard time with any of the issues mentioned above, come visit the Texas City optometrists and be sure to get your child examined for CI.